Filled with situation-specific prompts, this sweet collection invites you to express your gratitude for mom. 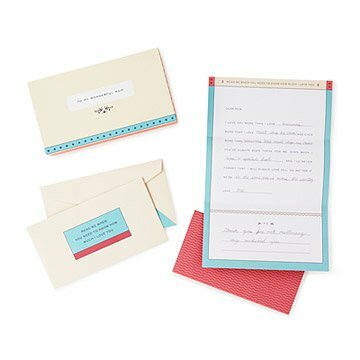 Give your mother a tangible reminder of how much she means to you with this touching letter set. Filled with situation-specific prompts, such as, "Read me when you need to know how much I love you" and "Read me when you miss me", this sweet collection invites sons and daughters to express their gratitude and recap memories that will make her beam. Fill in the eight missives, seal them in their corresponding envelopes, and present the whole package in the lovely keepsake box. Like receiving a hug from miles away, each letter can be opened at just the right time to warm Mom's heart. Made in China. Includes 9 cards and 9 envelopes. Made my mom cry but she loved it. It's a great way to help your mom or mother figure feel like you still think of her while you are on a trip or living far from home. It's a great product and I would buy them again and recommend them for people who would want a unique and special gift for their mothers. I loved it, it's a great present for mom, she loves it. It could be more unique, better written. Pros: cute colors and design, thoughtful, comes with nice box, well priced, good variety of topics for cards, meaningful. Cons: these are very small picky things- overall I think it's a wonderful gift. Sometimes how much space you have to fill in was too big or too little, sometimes prewritten wording didn't flow with what I wanted to write. I have this to my mum for mother's day and she absolutely loved it! A great way to always tell your mum how you feel. It was easy and fun to fill out. A wonderful gift for any mother! My mm is 87 and lives inNew York and I am in Florida. I found such joy in filling out these letters. My mom got the letters on the day before Mother's Day and LOVED it! She plans to open them when each letter is appropriate. Best gift EVER!! I like this item because the notes are both fill-in-the-blank format AND have a space for a personal note. This is a gift that can stretch through the year - a gift that keeps on giving! Great for when you are stuck for an idea for a gift for someone who has everything. I also like the card stock used and the box the notes are stored in - it is very sturdy and a nice size.